It was a quiet weekend along the Wasatch front. The sun was out in full-force and it was hard to believe we’d endured a surprise hailstorm just Tuesday–mothball sized pellets filled the deck and yard and poked holes in the new plant growth–confusing the heck out of all of us, especially Hubby and son-in-law who had just assembled their brushes and stain buckets and were ready to resume staining the woodwork on the front balcony they’d started the week before, one of those “best laid plans of mice and men” gone quite awry moments. What a day to take camera in hand and explore the garden before the hot weather comes and the snakes come down from the mountain to slither about since no place in these mountains is secret to them. So, up one of the garden paths we go. Many though not all of the flowers in our garden are wild and indigenous to the area. 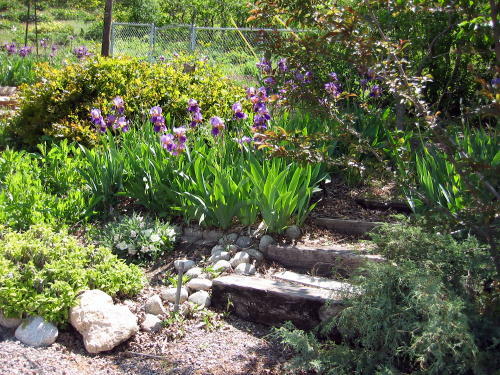 Notice the small shrubby bush on the left at the foot of the irises. 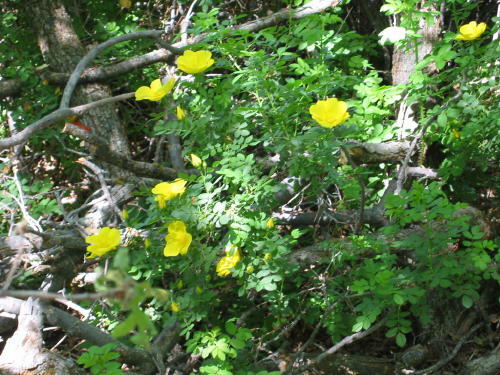 It has large white poppy-like blooms. I think it’s a variety of desert primrose. 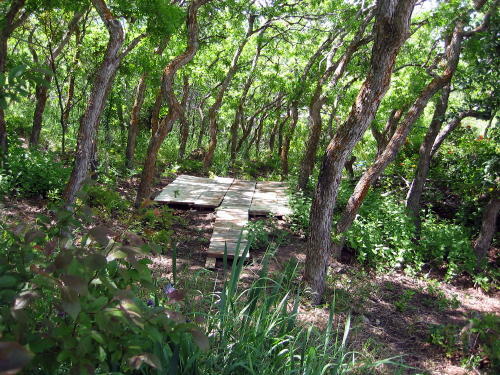 This is the hidden deck Hubby is building for himself in the middle of this thicket of Gambel oak trees. He’s planning to put a table and chairs here to hide himself when he feels like getting away from me now and then. But since I know where it is now, I may just meander up and surprise him once in awhile. He’s been very busy making several pathways that amble here and there through the garden. 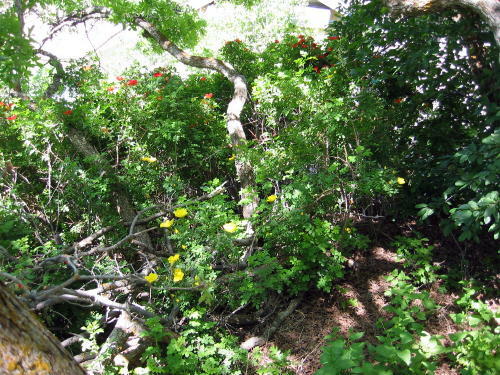 You see from the slope of the ground here that the garden is a steady but gentle climb from the deck behind the house all the way to the back gate at the top where the yellow flowers from the picture post a week or so back are waning but still blooming. 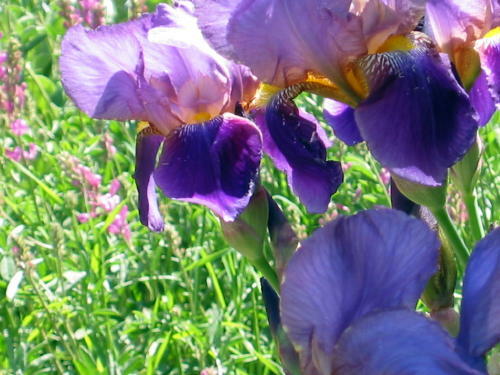 The irises are so gorgeous, and they seem to jump out in front of my camera begging me to take their pictures. See this camera hog? See the way it juts its way into the picture I was trying to take of the wild pink flower that looks like desert lupine? But again I’m no expert on wildflowers. A little while ago a yellow butterfly with black designs along the edges of its wing fluttered by. He was a Swordtail. I wanted him to stop and let me take his photograph, but being the suspicious sort he declined and flew on. He sauntered back and forth a few more times, the flirt !, before heading off for who knows where? 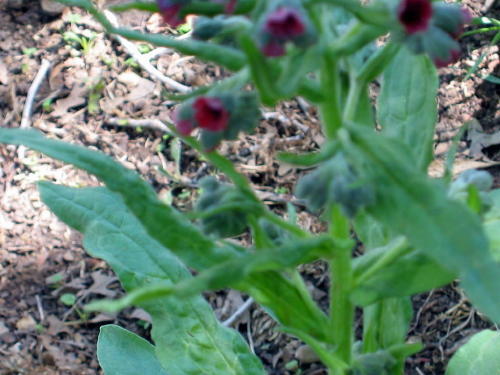 This little “nicotinic” or “tobacco” looking flower just came up from nowhere in the lower yard last summer. This year it’s taking root in several areas over the whole garden. 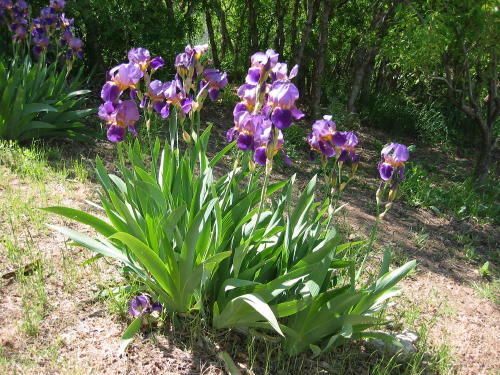 It has a small reddish purple bloom the develops in clusters near the top of the plant which grows to about two feet. If the irises are the royal ladies of the garden, this shy little thing is the blushing milk maid trying to be inconspicuous as possible so as not to attract too much attention lest someone question her fortune. It takes weeks to unfold from its tight little buds as if it isn’t sure it’s safe to show its full beauty. 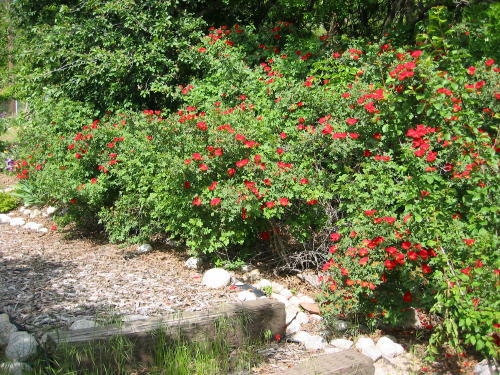 These wild roses are in front of Hubby’s secret deck area and completely blocked from view from the house. In fact, I see them today for the first time, the direct result of the brush clearing Hubby’s been engaged with for weeks preparing his hideaway. Fancy that. I never knew we had a wild yellow rose. Here it is a little closer up. 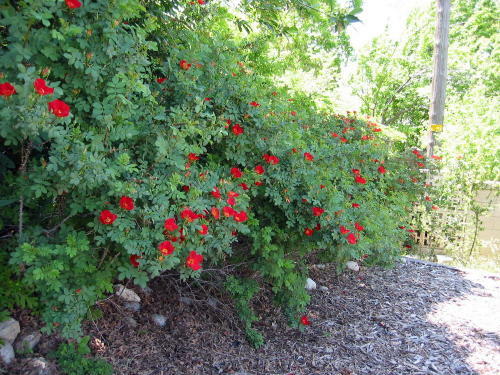 [Below] Moving to the other side of the yellow rose and descending downward towards the house, is the red wild hedge rose I look forward to all winter long. It usually blooms heavily the first two weeks in May, and then it rests all summer long as a non-descript green hedge, and waits quietly to dazzle us again for two weeks next spring. It has finally decided it’s time to bloom this year–a full month late. Better late than never, I say! Can you hear the song I’m hearing? Blooming here, by my path, grows a lovely wild rose, greeting so shyly, all who pass by. Or something like that. On the other end of the hedge above, [below] you’ll notice still another pathway leading down behind the house in another direction. I know the grass needs to be pulled and it would look a lot neater if it were, but it isn’t, and that’s okay. We’re hired a garden service that comes every two weeks in the summer, and whatever gets done gets done. We choose not to worry that our garden doesn’t look like a ritzy suburban garden. In order to keep it that way, I know, would require much more work and effort that either Hubby or I are willing to expend at this point in our lives. Luckily, we both rather like the informal, natural look of our garden just the way that it is. That’s it for now. The flowers and the view changes over the weeks as the summer leaps along. Soon the tea roses will be blooming, and I’ll have cut roses in vases to enjoy inside. That will be for the hot part of the summer when the snakes may decide it looks really cool and shady here, especially in that hideaway of Hubby’s. But we won’t mention that word anymore today. If the walk hasn’t mellowed you enough, or if all that talk about you-know-what has you all edgy, here’s something sure to settle your nerves–if you have time–that is. This is Edward MacDowell’s famous composition recorded in 1929 by the Musical Art Quartet. It consisted of Louis Kaufman on viola, Sascha Jacobson and Paul Bernard violins and Marie Roemaet-Rosanoff on cello. A picture from the 1920’s shows them to have been quite young. All were quite well known at the time, but Kaufman (on violin) later became quite famous. He was known for promoting newly written music. Merrihew uploaded this on YouTube about a year ago “because I really like this piece and Columbia Vivatonals sound particularly good on the Orthophonic.” There are many YouTube videos for this piece, but this is one of the prettiest and unusual. This entry was posted in Music, musing, Musings, Personal, Photography, Videos and tagged flowers, garden, nature, walk by Alice. Bookmark the permalink. What a beautiful walk. Thank you. I do miss my garden here. We have just found a new apartment here and I am very excited because it has a large terrace and I am already planning the “container” landscaping that we will do. Mostly winterhardy, of course, but I am hoping to still be able to get some vegetable even though we don’t move until the end of the month. My garden, which I had just “finished” with hardscaping when we left, is the thing that I miss most. I loved the walk in your garden and all the hidden treasures. Oooh, I really enjoyed my walk in your garden. It’s just gorgeous! Love those iris’s! 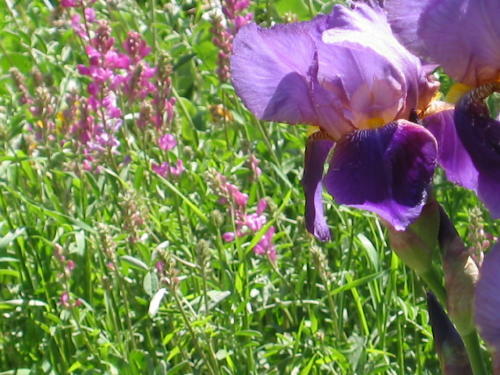 You have a lot of property there and I adore wild flowers. It all looks SO pretty and it sure is a very tranquil place. What a refreshing post! I am jealous of your garden. It is absolutely beautiful and very peaceful looking (snakes aside). I love our desert country but I so miss the beautiful gardens. Right now our yard is in ugly transition from grass to desert landscaping and we probably won’t finish it until Lynn retires the 1st of the year. I also love your choice in music.